I thought I’d written about this before but apparently not. Since some screentime is inevitable when I’m working and NO ONE is napping, I’m always looking for recommendations from other moms on apps they use with their kids. So here is a collection of MY personal picks for the best apps for Toddlers/Preschoolers. Synopsis: This one is recommended all over the place but it’s truly phenomenal. Basically it gives a word and a definition then has your child “spell” the word (matching letters to their spaces) while pronouncing the letter sound. Then it gives the definition and shows a short animation of the definition. The words are interesting and diverse and it’s extremely well animated. Cost: $6.99. I was lucky enough to download it when it was free (about 2 years ago). I personally hate when apps aren’t free to try before you buy and unfortunately this one no longer is BUT I think it’s well worth the cost. My 3 year old started using it around 2 and still uses it. Plus they occasionally add new words so it doesn’t get redundant. Synopsis: Similar to Endless Alphabet this encourages counting along with number recognition. Each number will have some counting sequence (by ones, twos, fives etc) then include an equation. It doesn’t necessarily teach addition but it does help preschoolers begin to recognize numbers to 100. Cost: Free. The first 5 numbers are free to try, then you can purchase 6-25 or 6-100 depending on your child’s interest. Synopsis: This interactive puzzle of the United States either identifies the state capital or a fun fact about each state as it appears. It doesn’t have “levels” or a way for it to get more difficult but the redundancy of doing the puzzle helps the information stick. My 3 year old can name about 21 states on a blank U.S. map and usually remembers the fact about them. 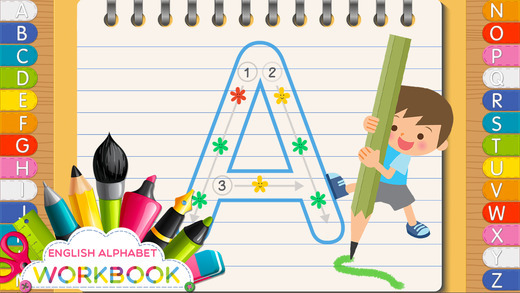 Synopsis: This writing app provides kids with a “path” to follow to create both uppercase and lowercase letters. The nice part is that when they complete a letter the template disappears and you can see their tracing path so you can see how they actually wrote each letter. Cost: Free. $1.99 removes ads. Synopsis: This game is similar to tangrams. It has several puzzles that can be created with blocks. When the puzzle is completed it animates the image. It’s entertaining but a bit repetitive. Synopsis: This is one of our “fun” games. 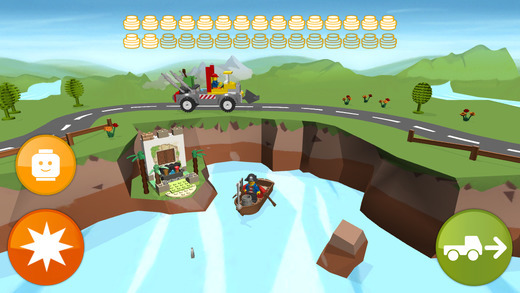 Basically it lets you build Lego cars and collect coins and earn additional pieces. Since my 3 year old loves building it’s a good choice for him. Synopsis: An interactive drawing game animates scribbles after prompting kids to draw certain items (a beard, hair, etc). It’s a unique twist on typical drawing apps since different drawings animate differently. Synopsis: This is our basic drawing app. It includes crayons, markers and paints. Kids can either color on a blank page or on several provided coloring pages. Synopsis: Bake cupcakes, cookies, cakes, pizza and more. Your child can decorate then eat their creations. They can even add candles then “blow” them out. There’s even a grey oven for the little fellows. My 3 year old loves this for fun playtime…plus no cavities from virtual treats! Synopsis: “Color” with musical instruments then wave your hand or touch the screen to play them. Entertaining though not necessarily educational. Synopsis: These are best for my 2 year old, mostly for quick entertainment (like in a waiting room or the carpool line). Simple musical apps. Cost: Free. Ads are included but easily blocked with Guided Access.